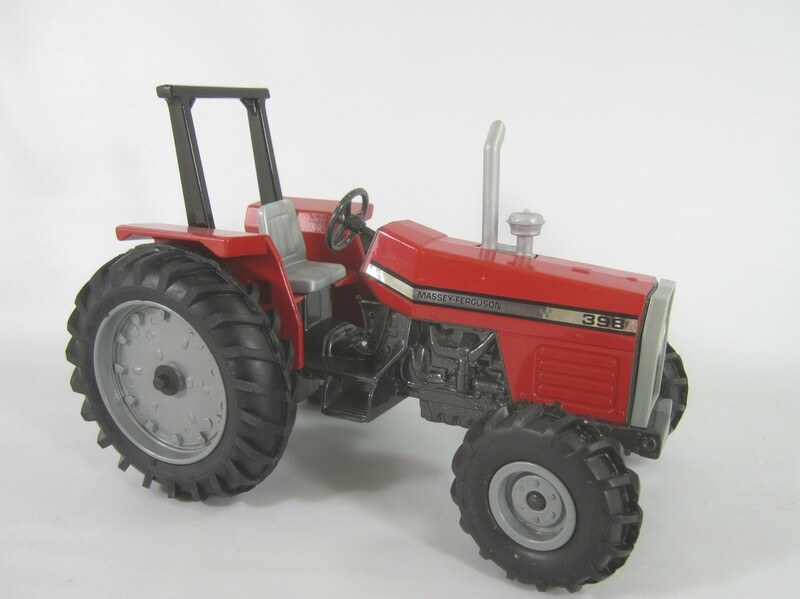 JLE Scale Models Stk# 1018. 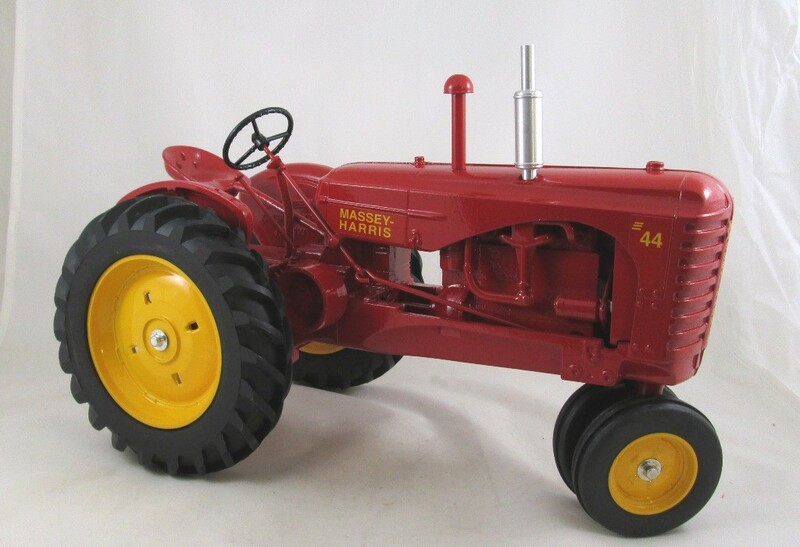 MH Model 25 tractor in 1/16 scale diecast. 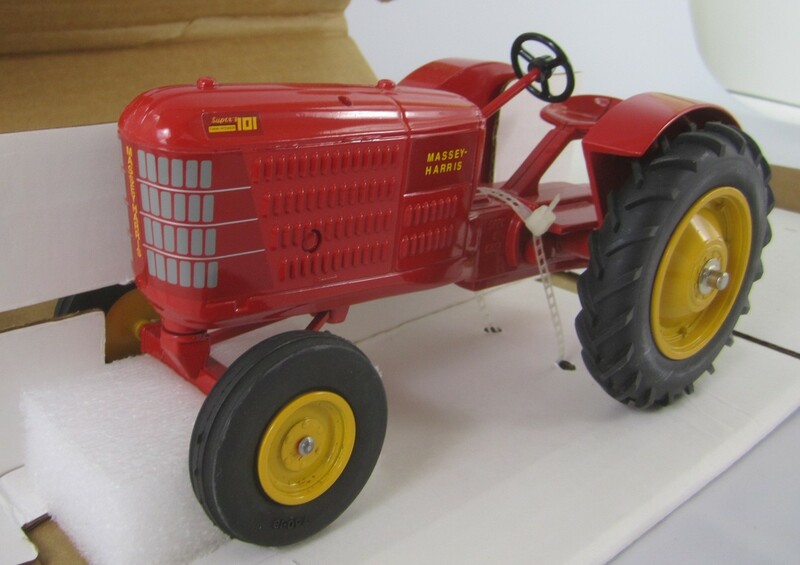 JLE Collector Series #18 and is Serial # "1190". 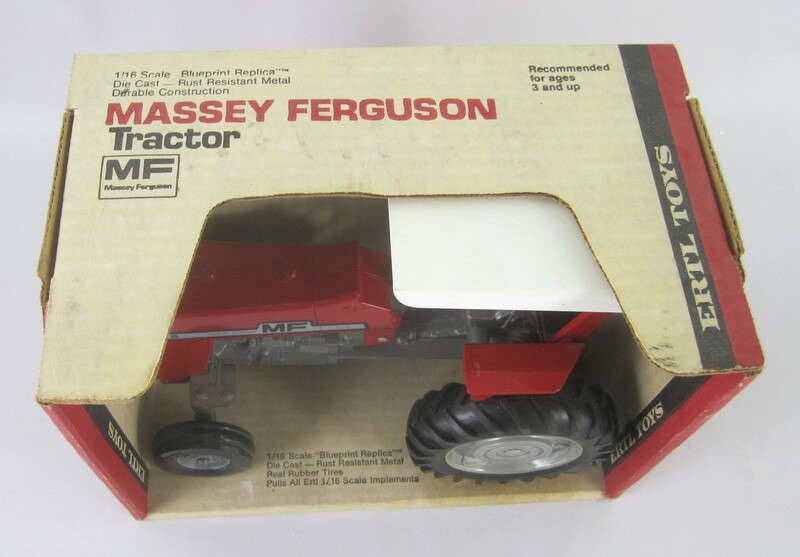 Made in the USA in 1991. 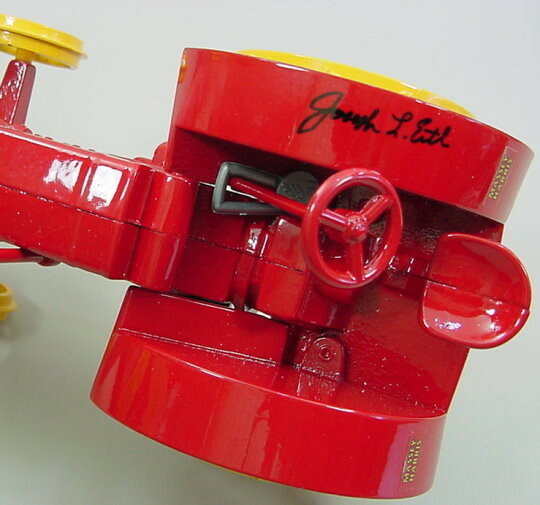 Autographed by Joseph L. Ertl. 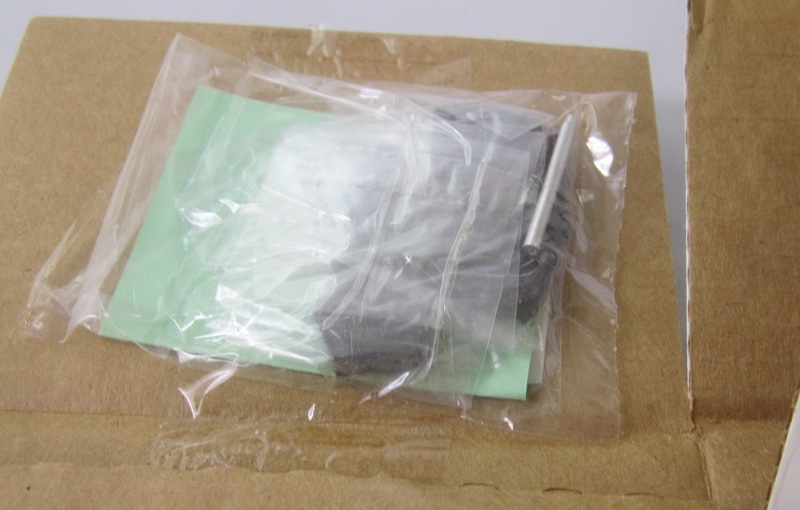 SpecCast Stk# SCT-145. 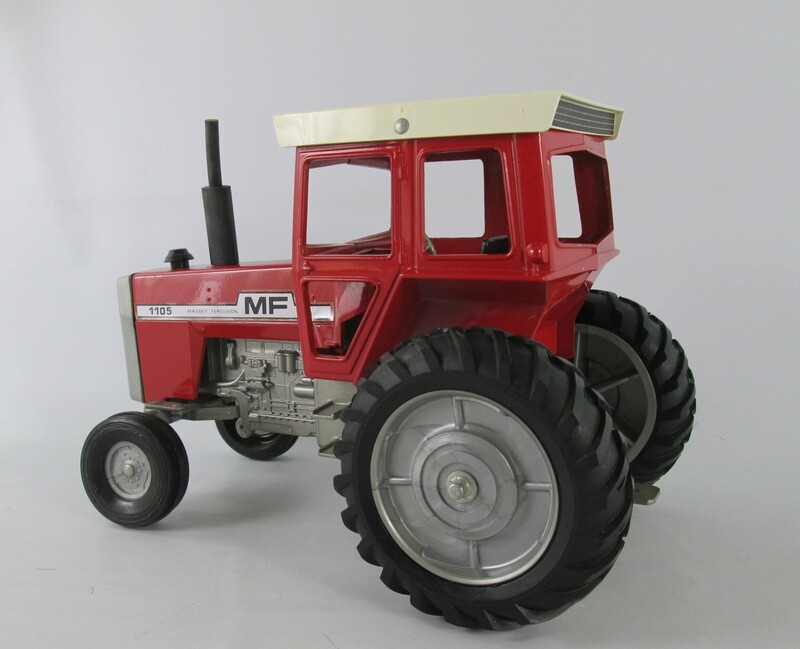 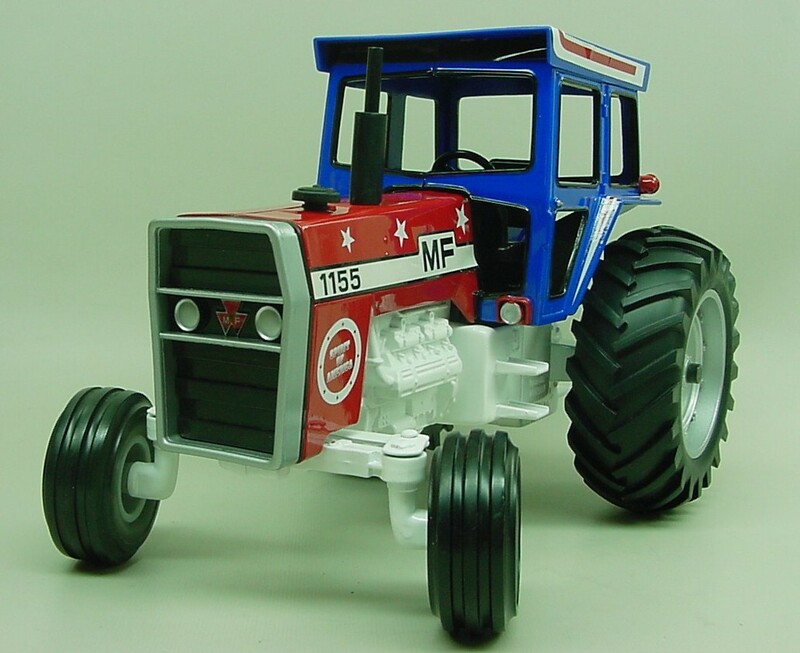 MH Model 101 with Side Shields tractor in 1/16 scale diecast. 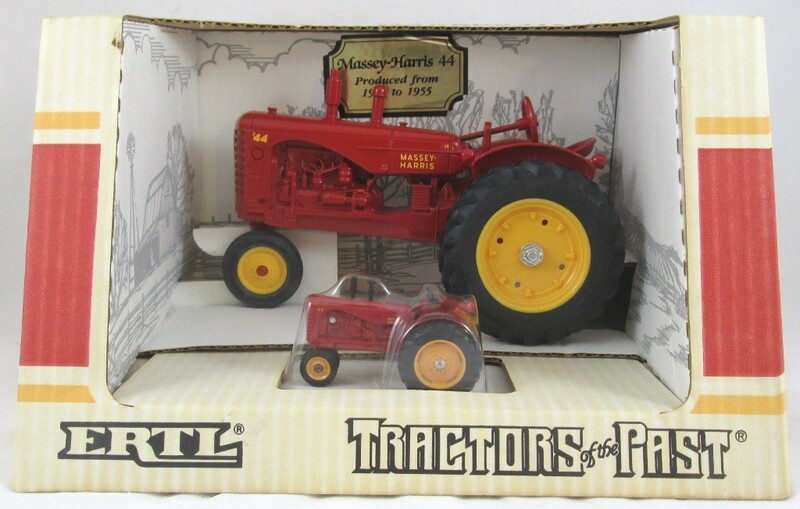 Collector Edition. 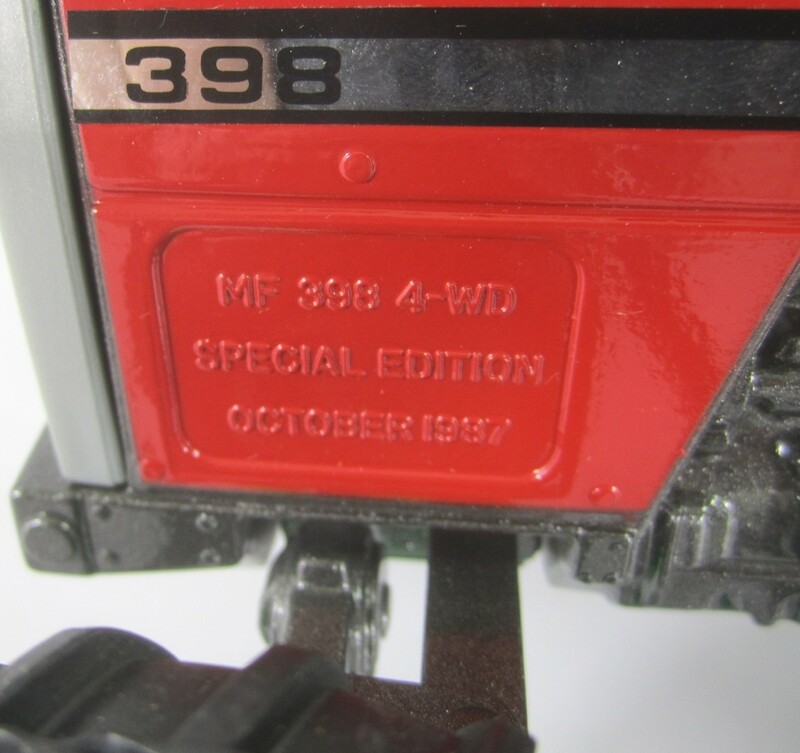 Made in the USA, June 30 1998. 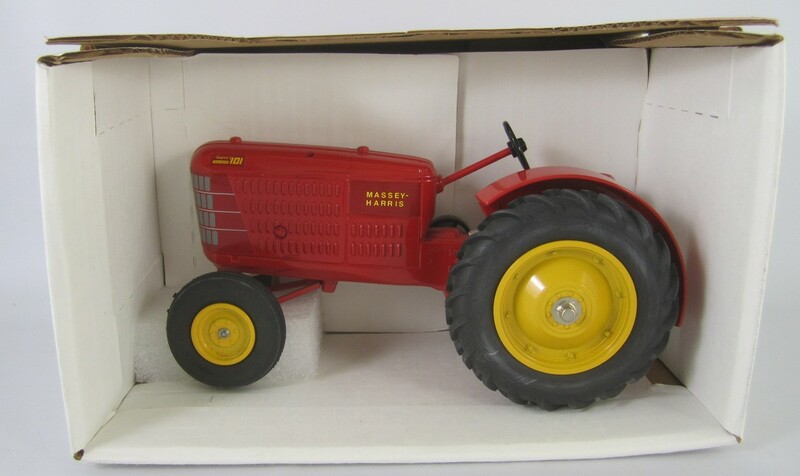 New in Box, Never Removed. 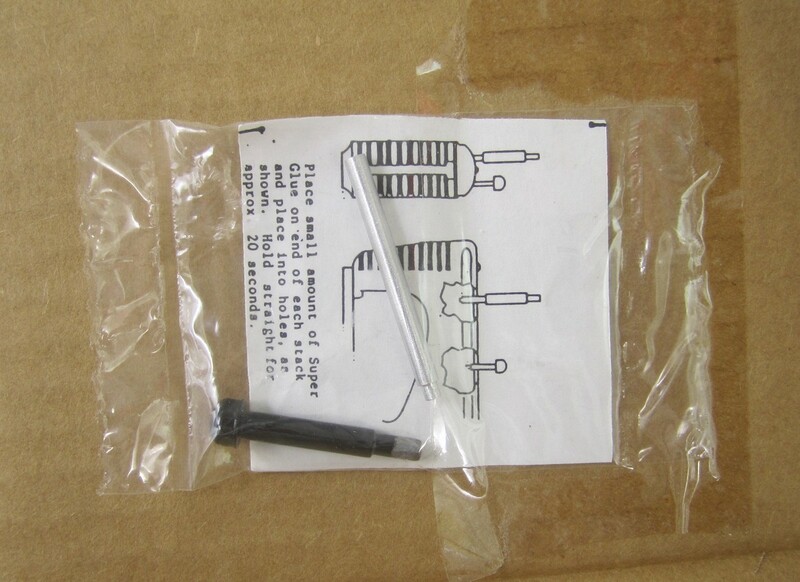 SpecCast Stk# SCT-166. 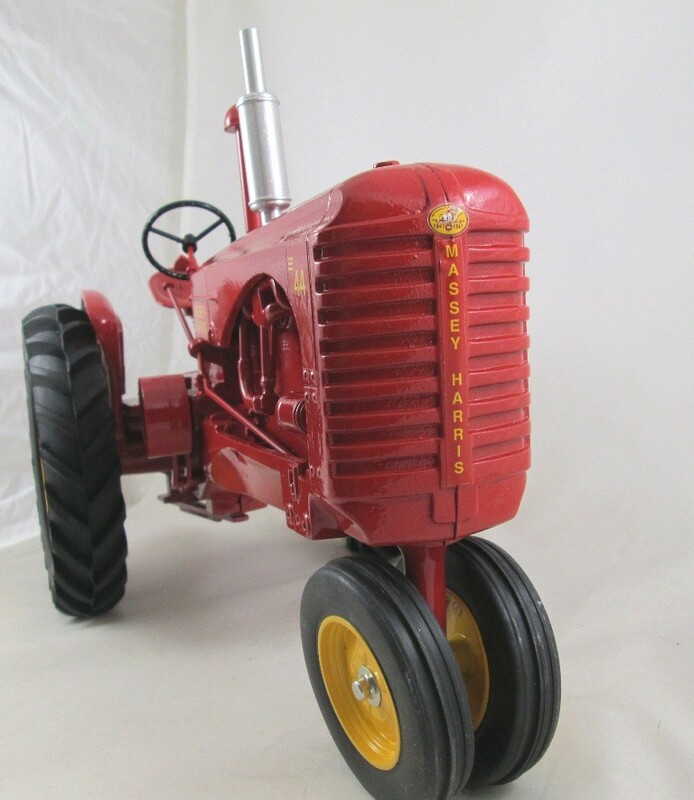 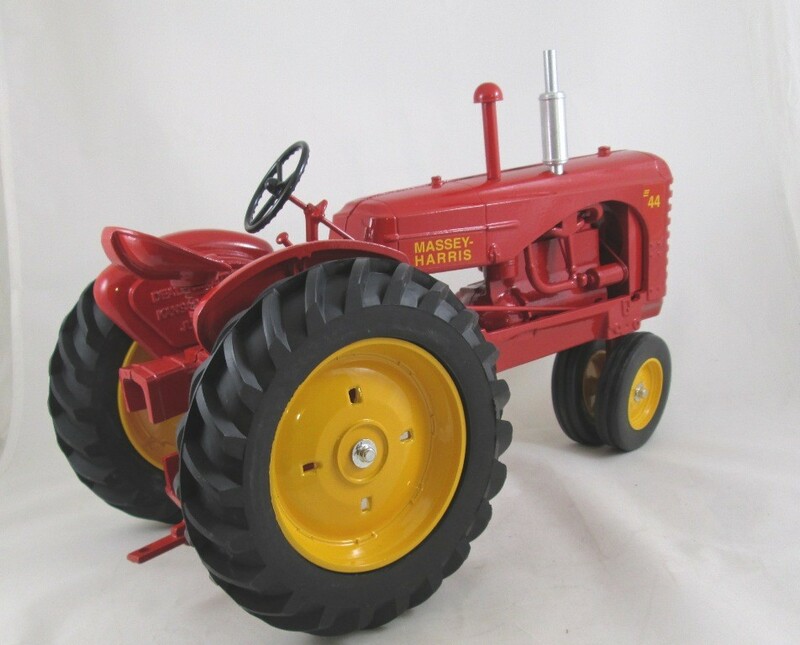 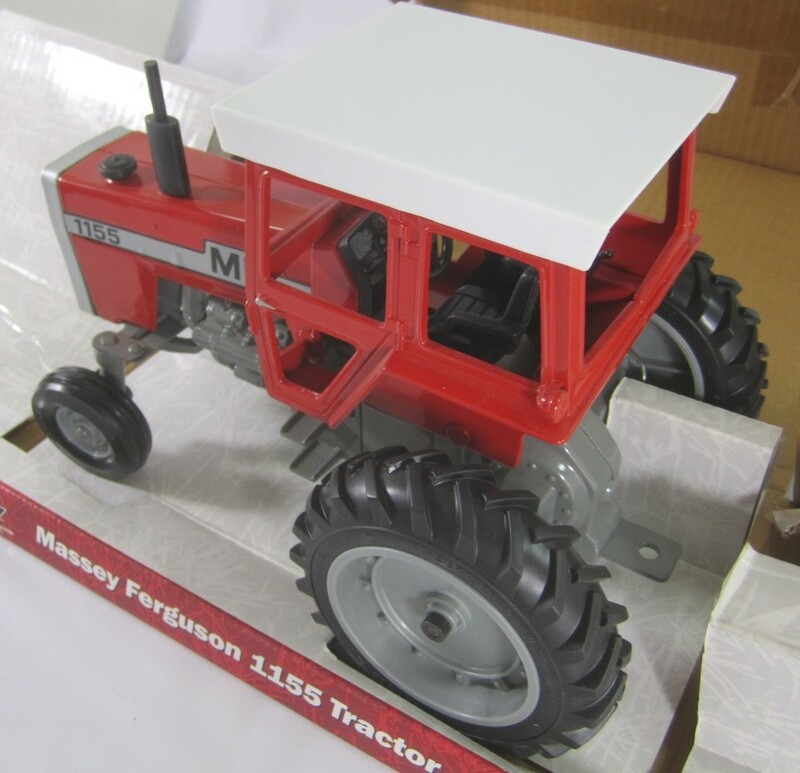 MH Model 102 with Side Shields tractor in 1/16 scale die-cast. 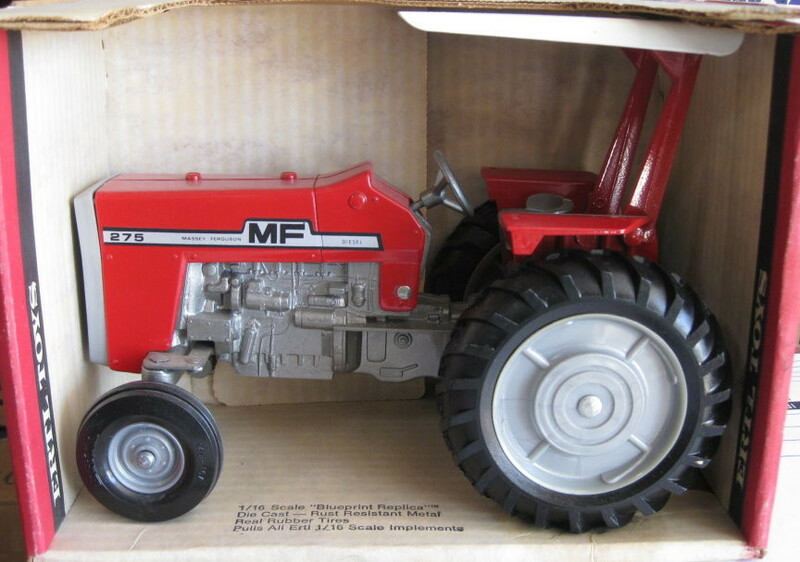 Collector Edition. 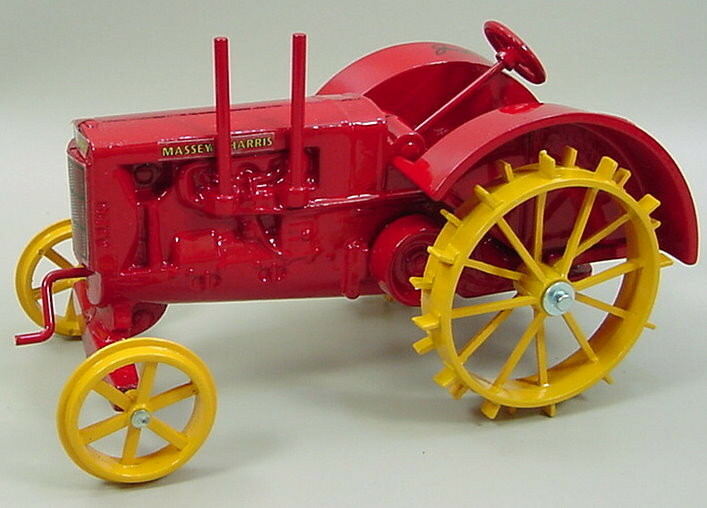 Louisville Puller tractor Jan 19 1999. 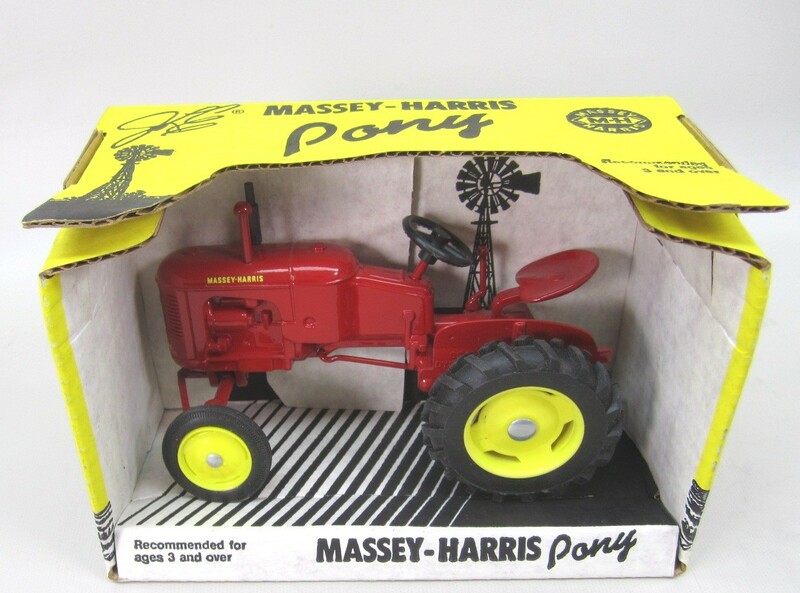 Louisville Farm Show Edition. 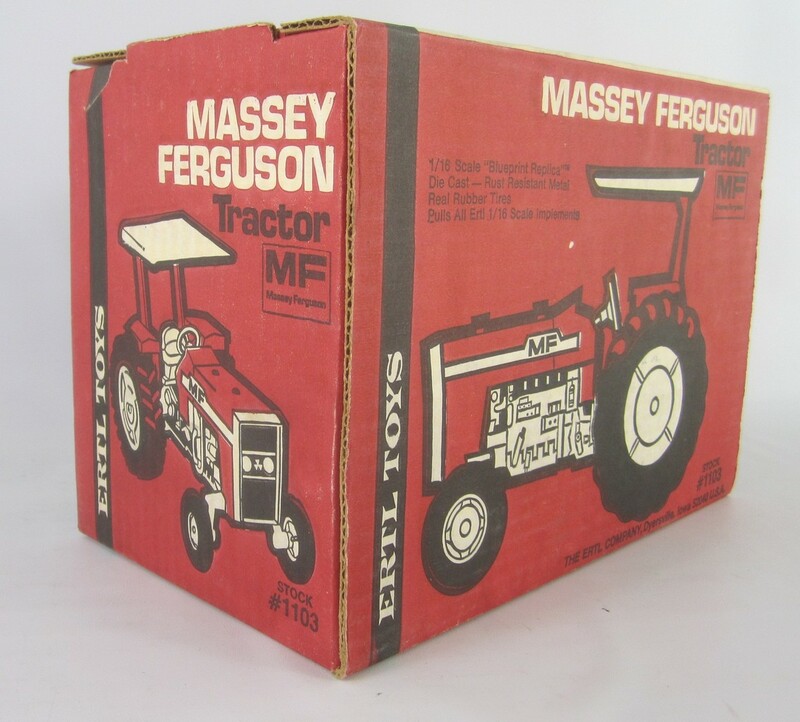 New in Box, Never Removed. 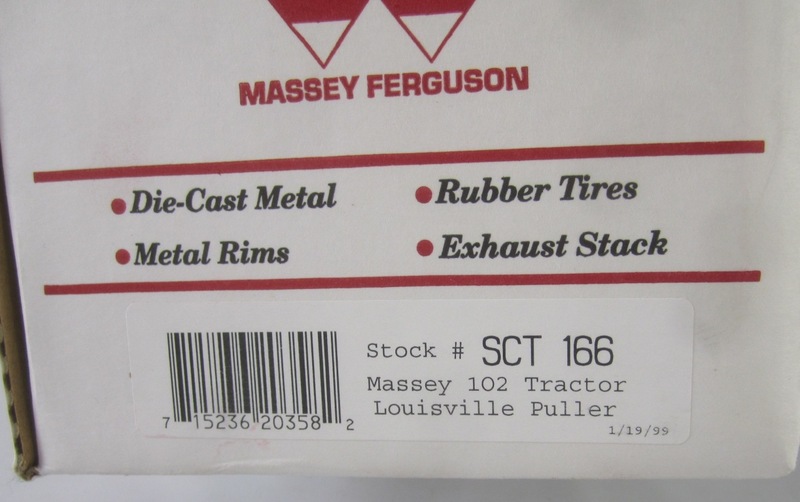 Weights and muffler still sealed in box. 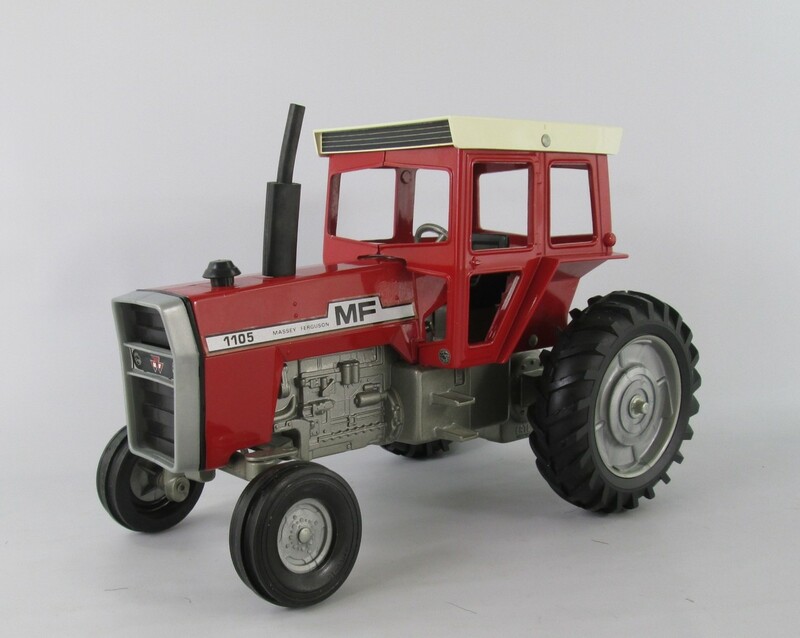 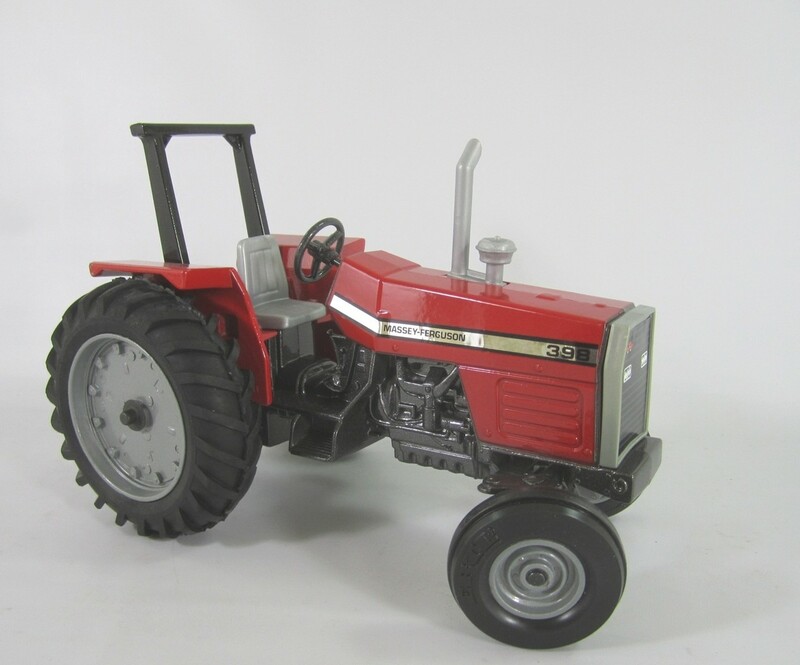 JLE Scale Models Stk# 2598 MH Pony tractor in 1/16 scale diecast. 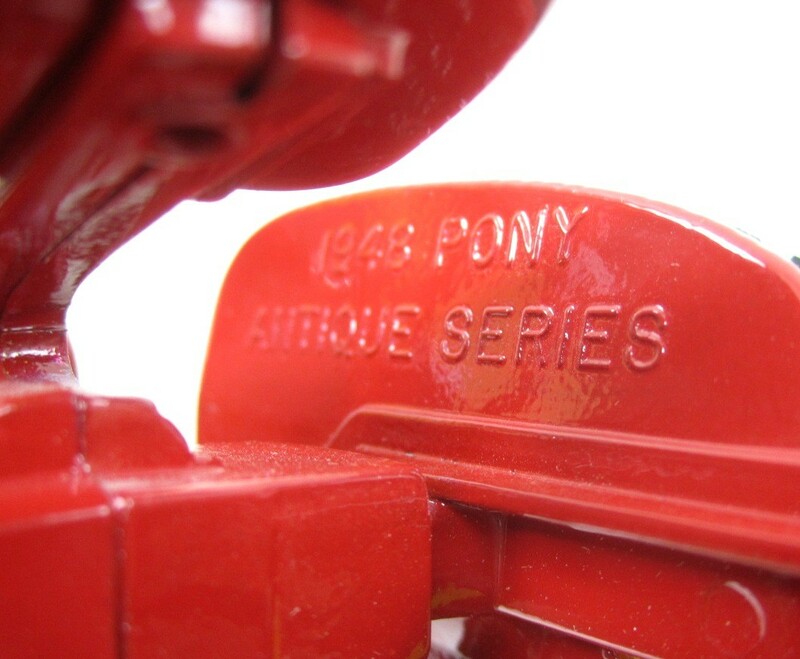 Marked "1948 Antique Series" and Serial # "1065". 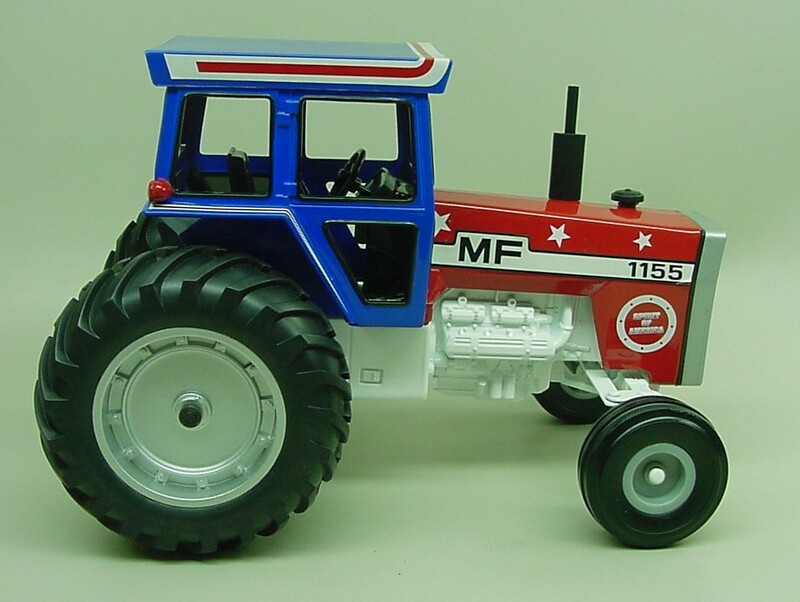 Made in the USA in 1994. 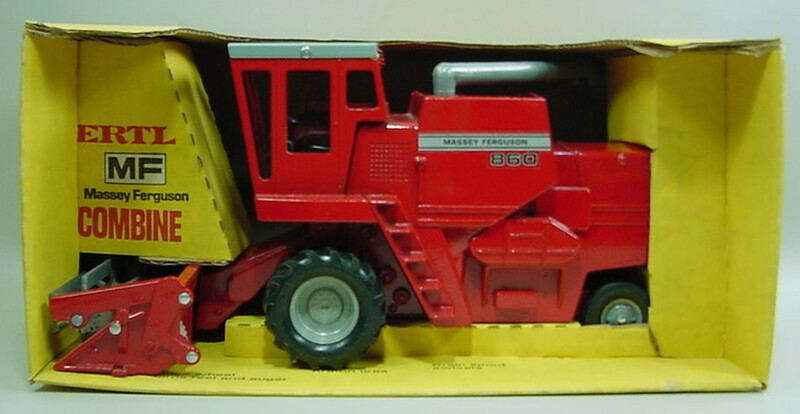 More of a Collector model than a play toy. 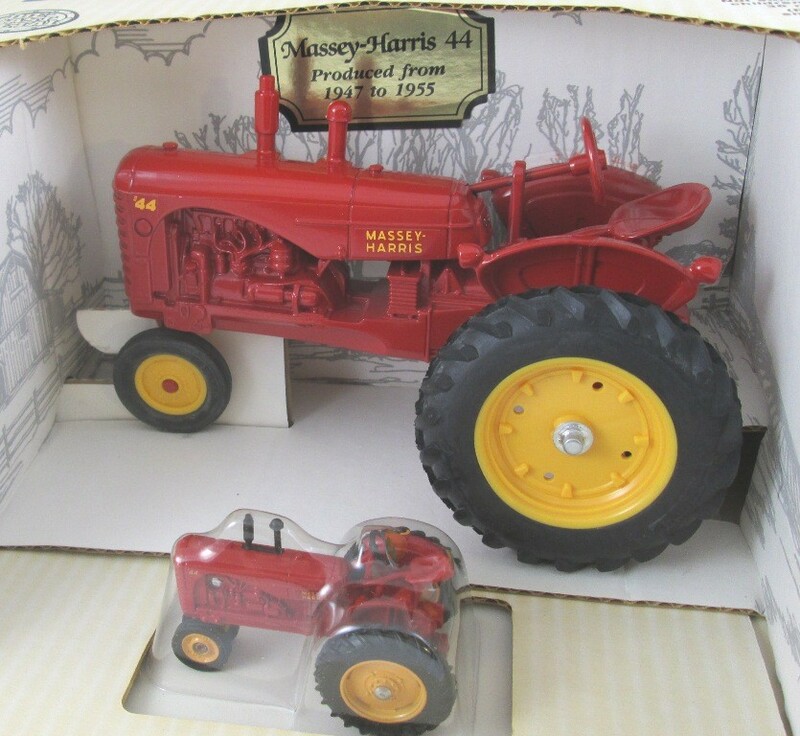 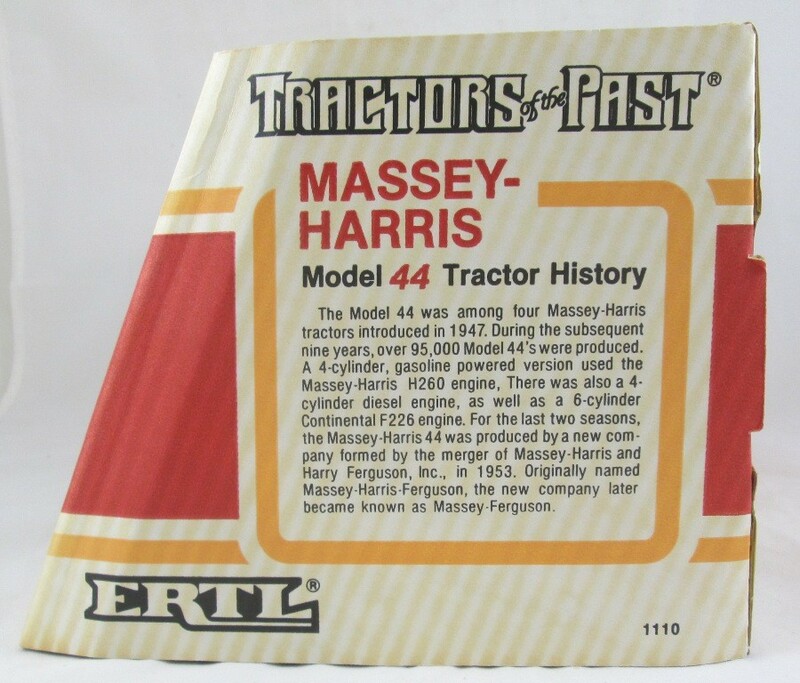 Ertl Stk# 1110 Massey Harris 44 Tractor in 1/16 & 1/43 scale. 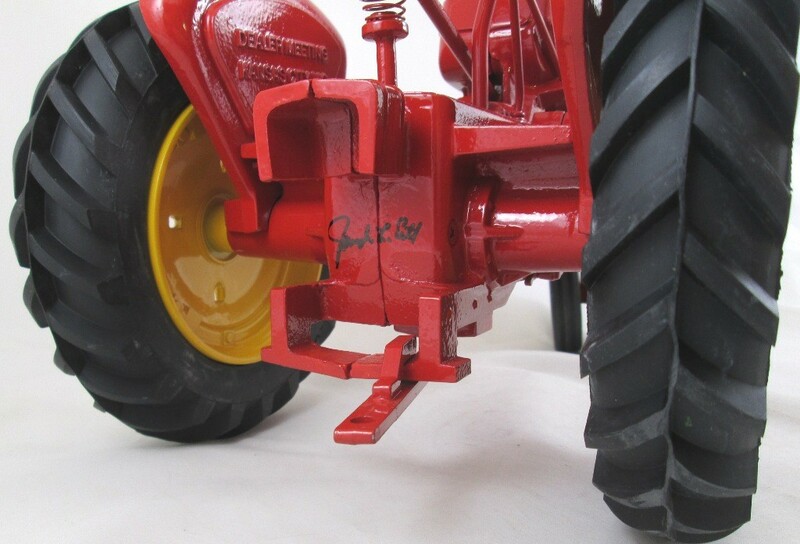 Die-cast metal1/16 has steerable front wheels and draw hitch. 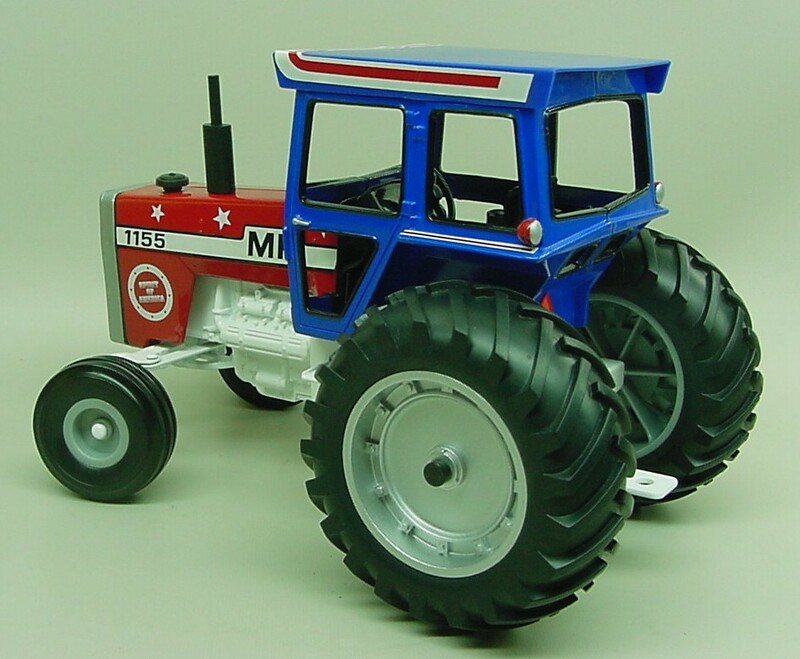 JL Ertl Scale Models Stk# FT-0832 MH 44 Narrow Front Tractor in 1/8 scaleCast Metal. 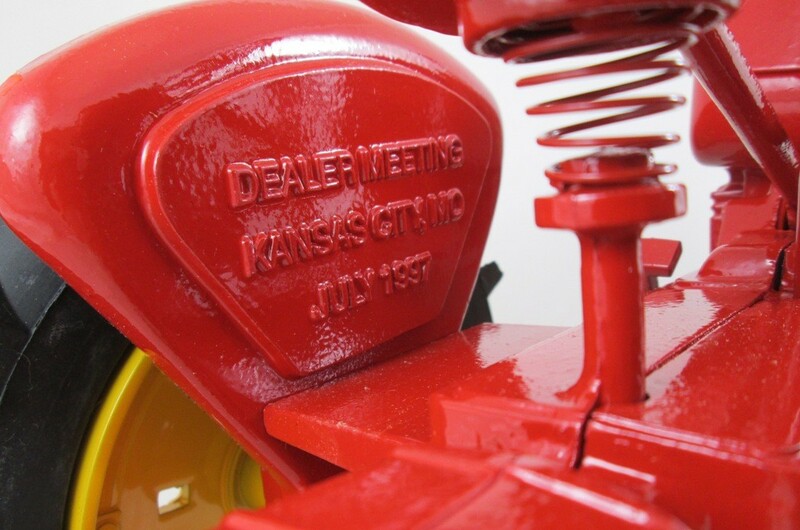 Made for the "150 Anniversary Massey Harris" "Dealer Meeting Kansas City Mo. 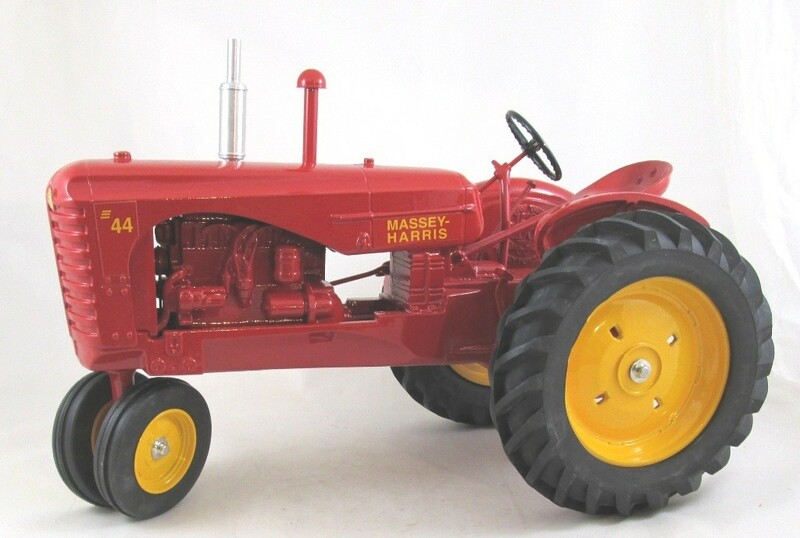 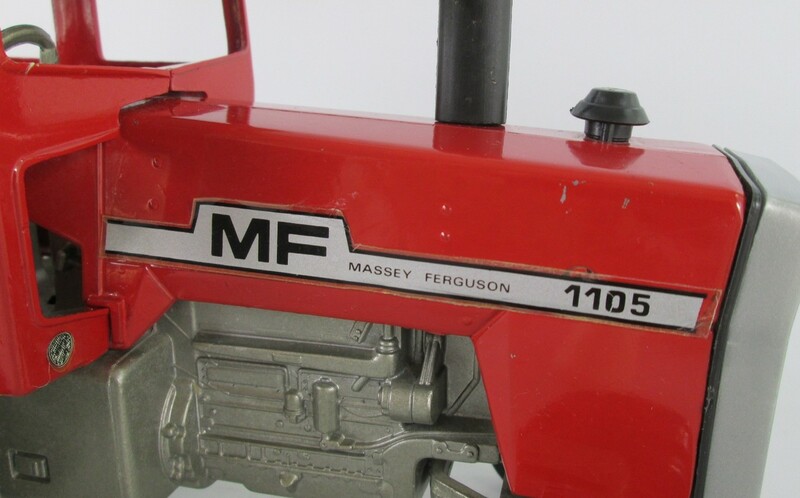 July 1997"
Ertl Stk# 161 Massey Ferguson 1105 Tractor in 1/16 scale. 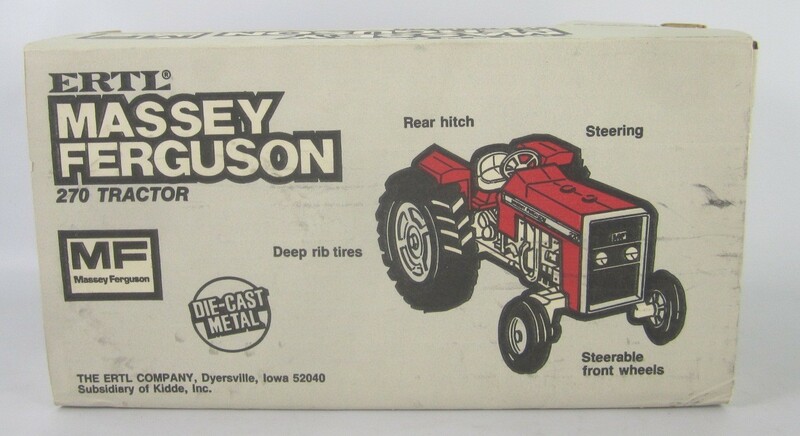 Die-cast metal with steerable front wheels and draw hitch. 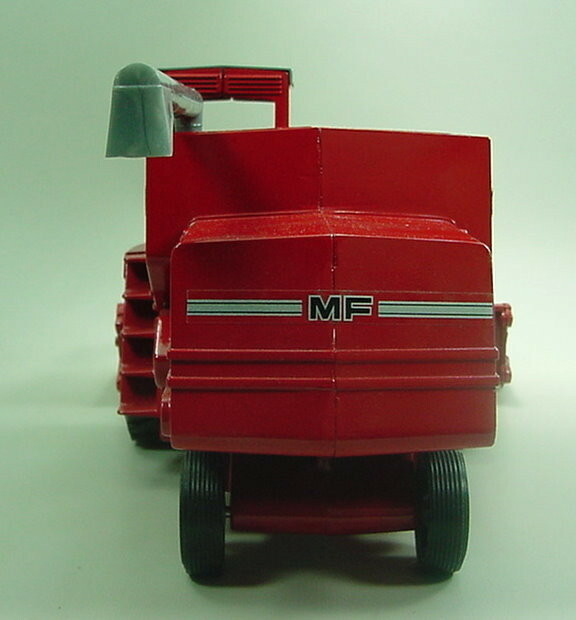 Nice with a few tiny paint chip on side of hood. 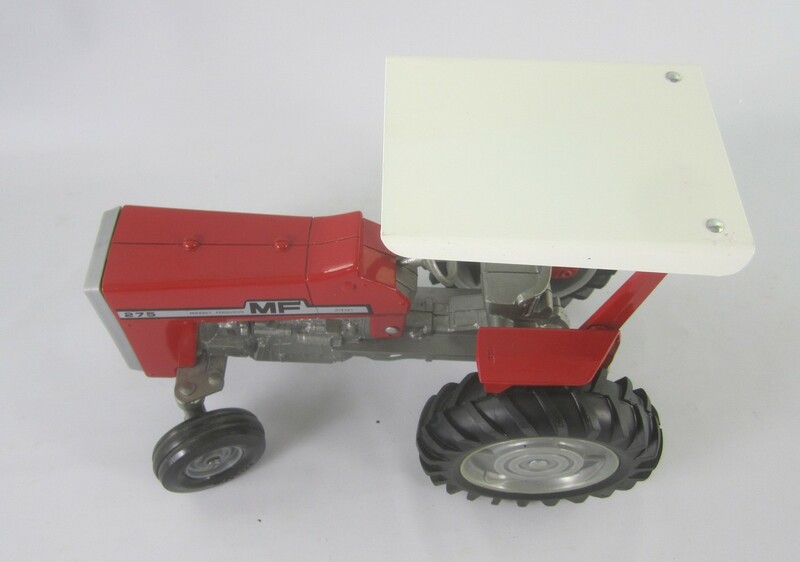 No Box! 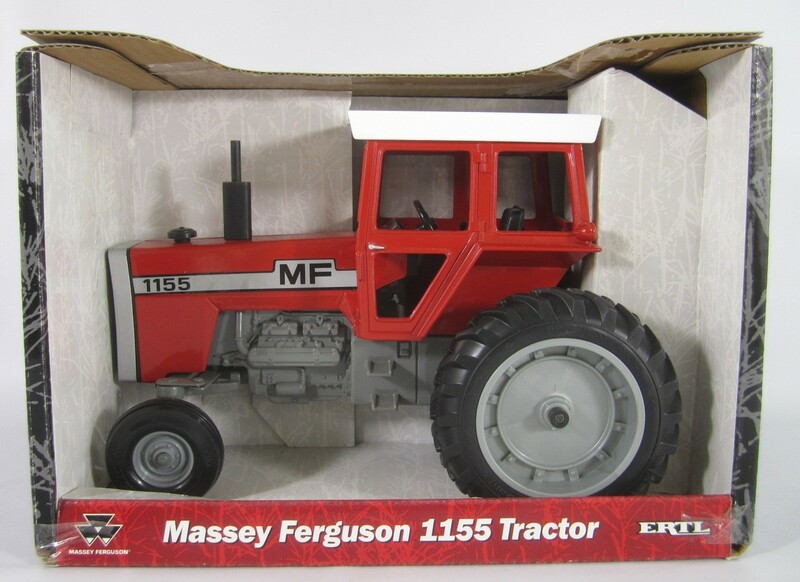 Ertl Stk# 13170 Massey Ferguson 1155 Tractor in 1/16 scale. 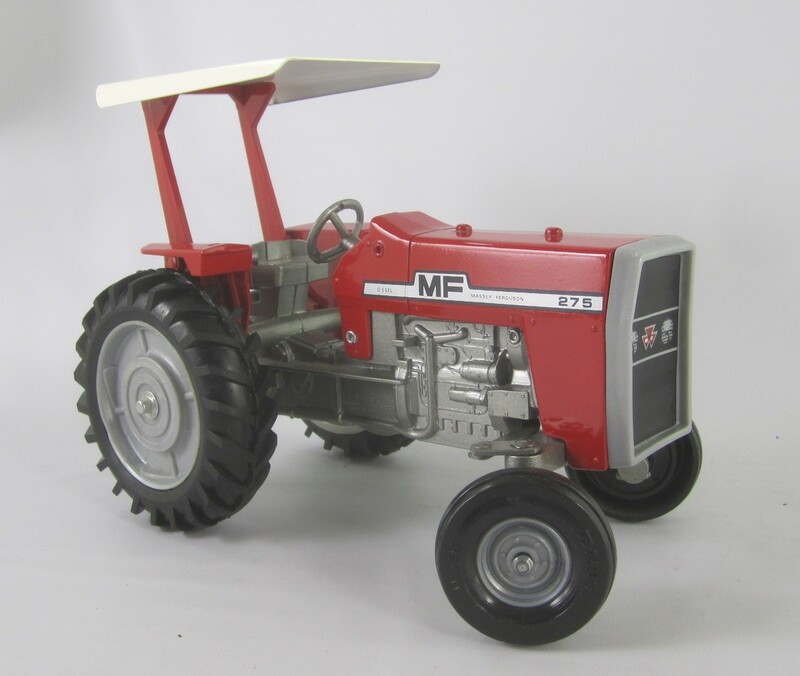 Die-cast metal with steerable front wheels and draw hitch. 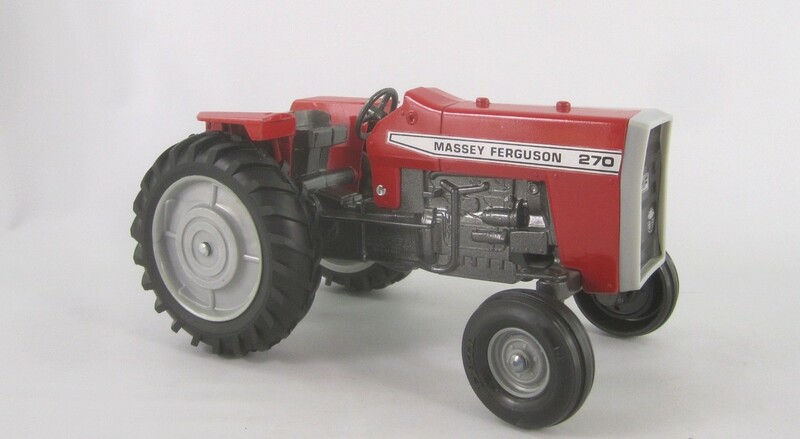 Made in 2001. 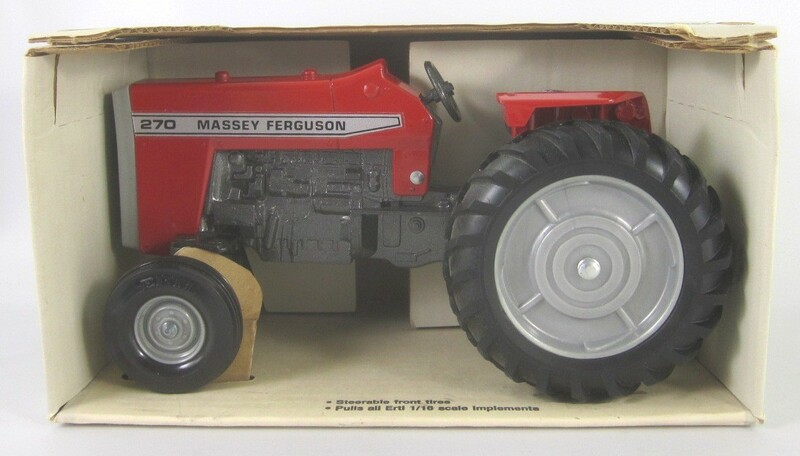 Ertl Stk# 16050A Massey Ferguson 1155 Spirit of America Tractor in 1/16 scale. 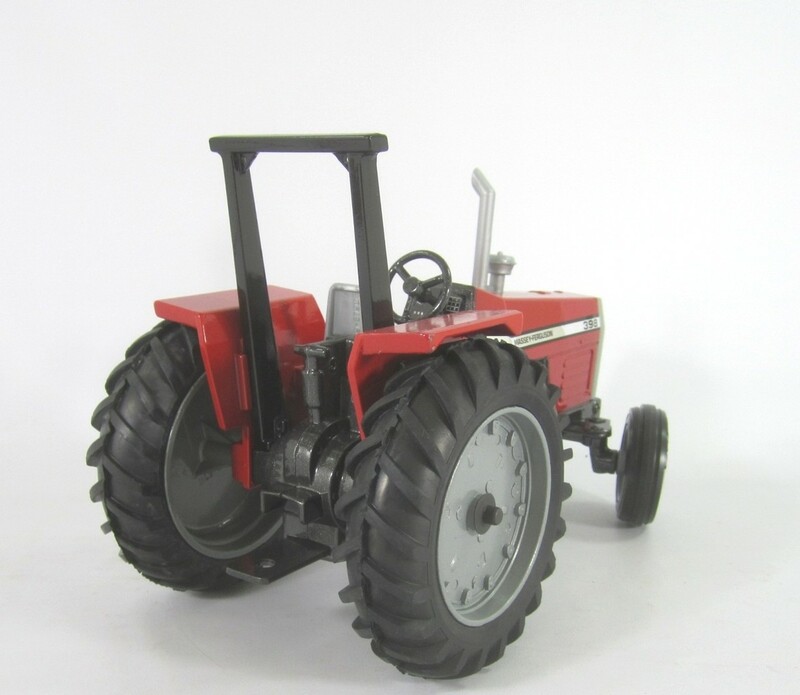 Die-cast metal with steerable front wheels and draw hitch. 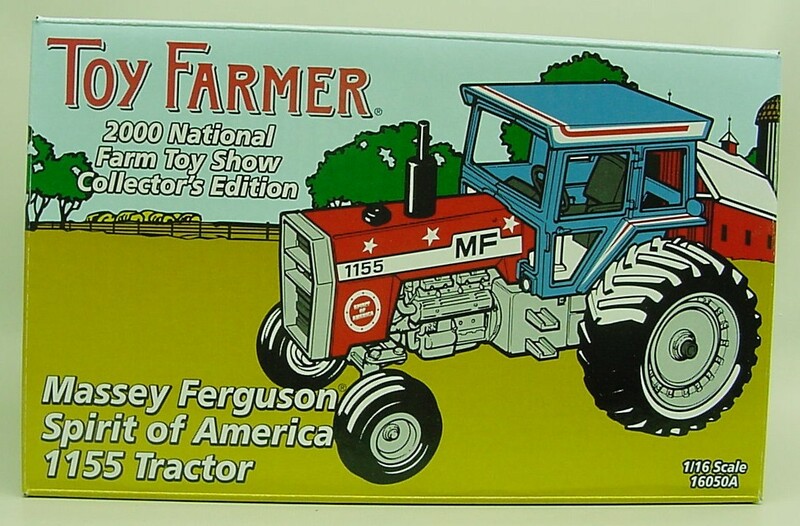 Toy Farmer 2000 National Farm Toy Show Collector's Edition. 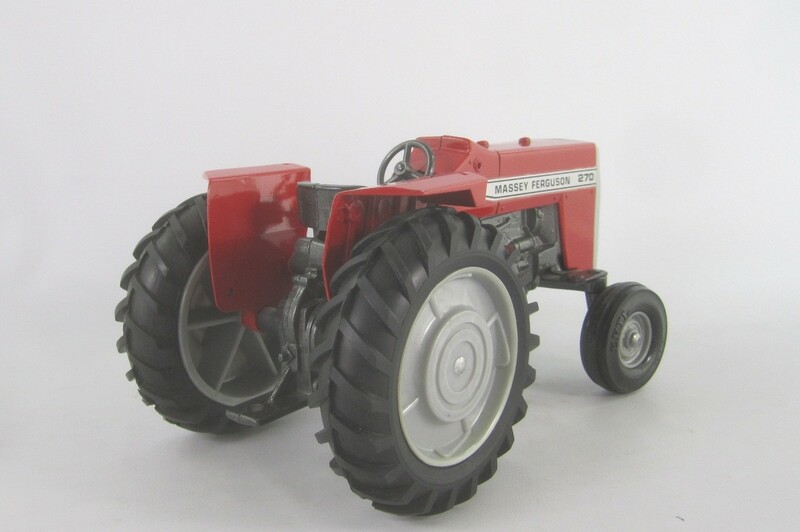 Ertl Stk# 1104 Massey Ferguson 270 Tractor in 1/16 scale. 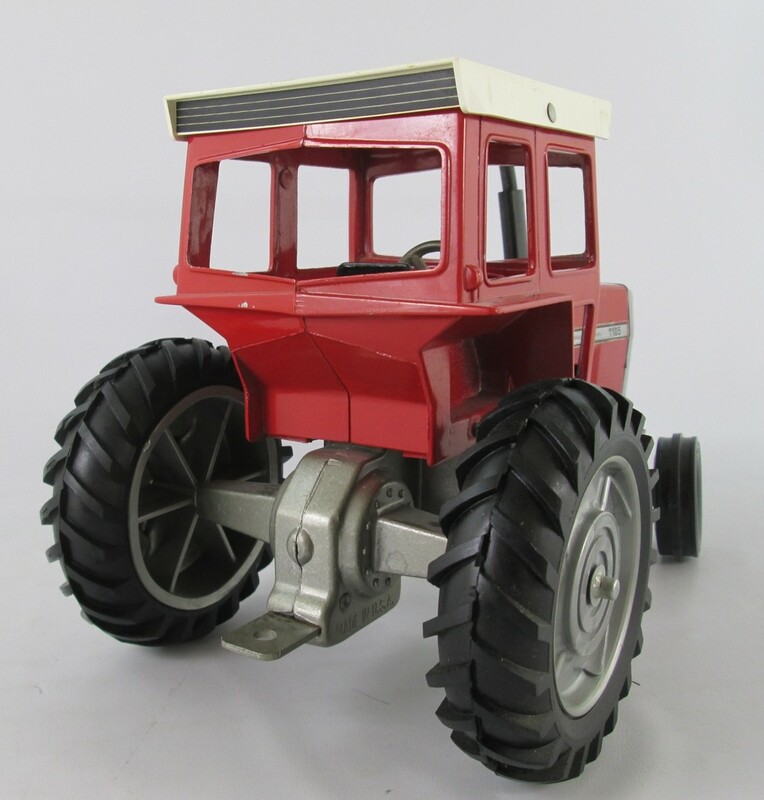 Die-cast metal with steerable front wheels and draw hitch. 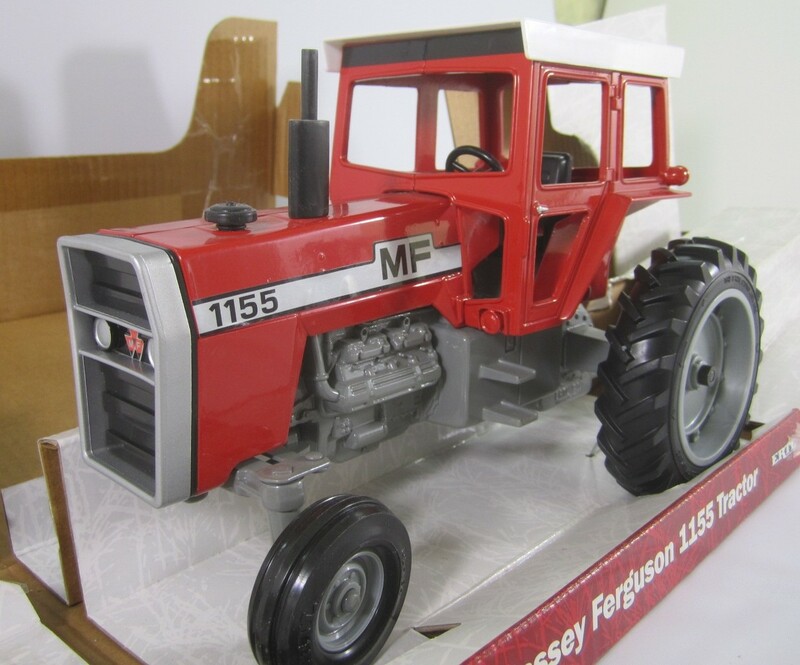 Ertl Stk# 1103 Massey Ferguson 275 with Rops Tractor in 1/16 scale. 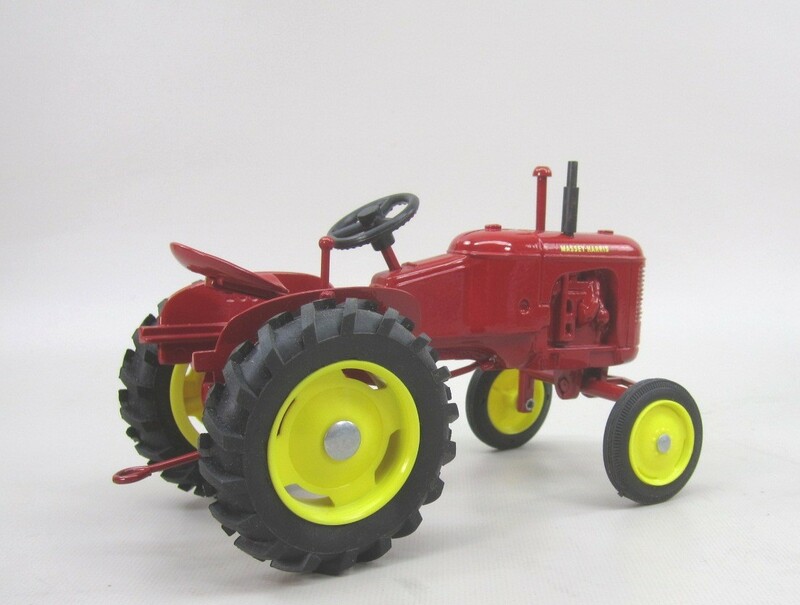 Die-cast metal with steerable front wheels and draw hitch. 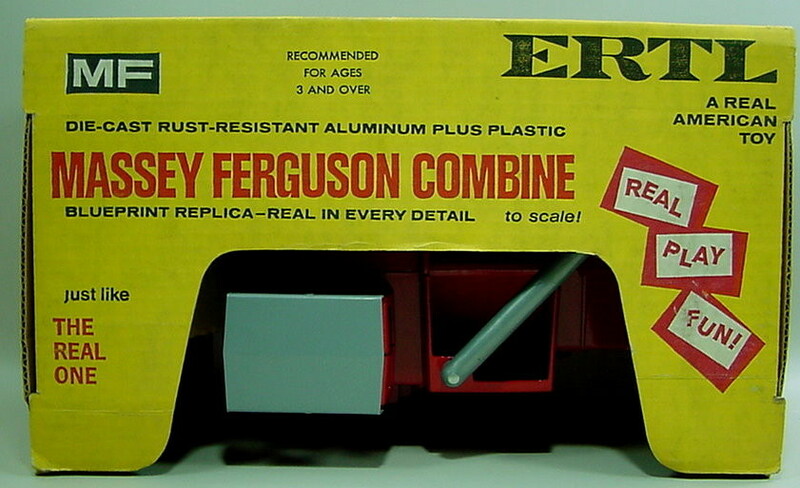 The Canopy is steel on this one. 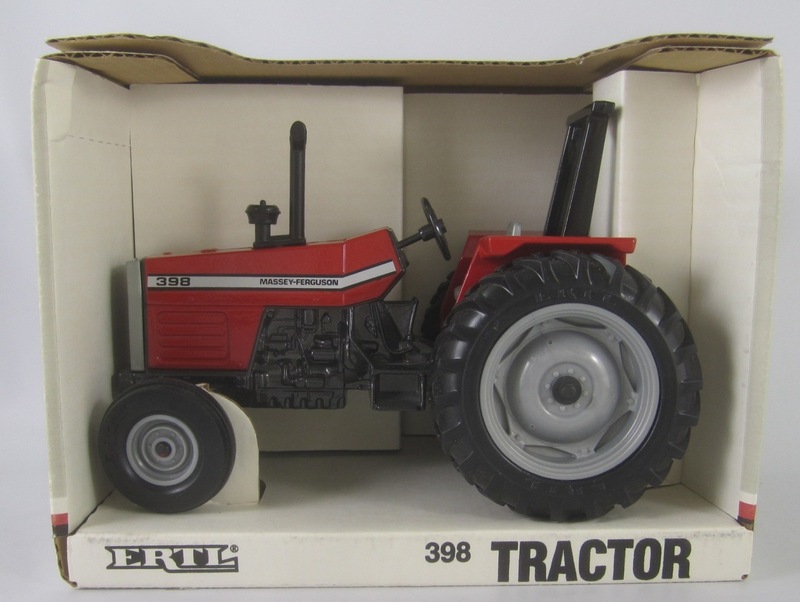 Ertl Stk# 1179 Massey Ferguson 398 tractor with ROS. 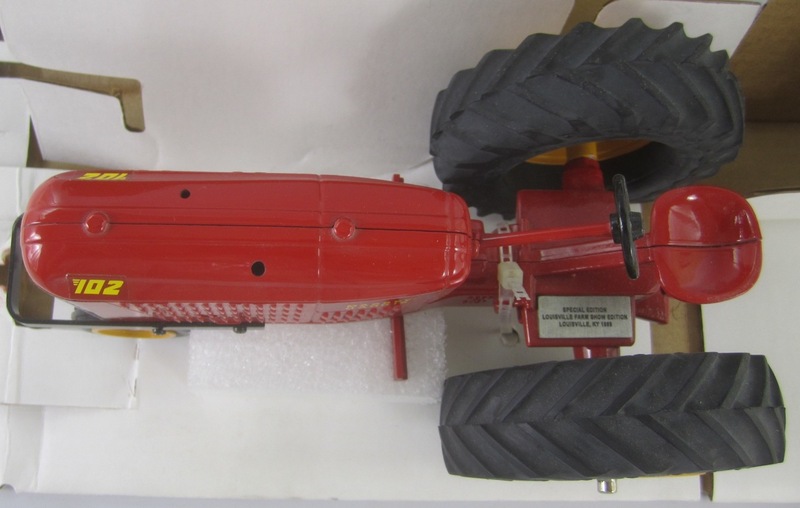 Die-cast metal 9 in long with steerable front wheels and draw hitch. 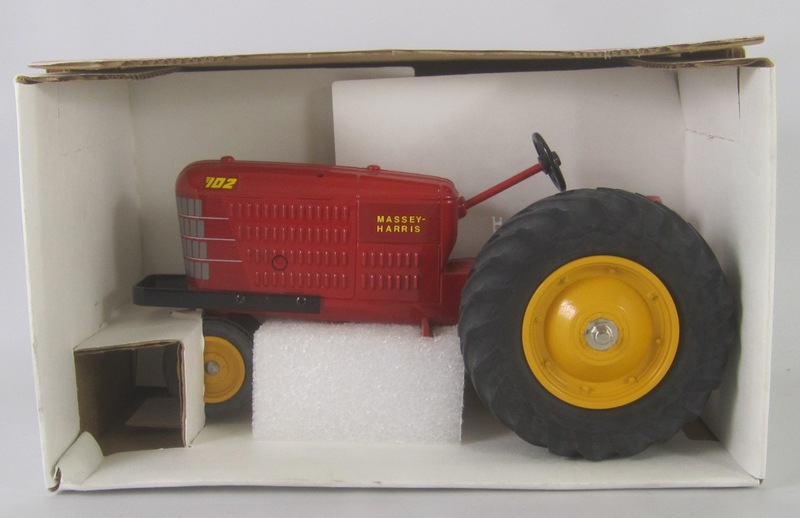 New in Box from 1990. 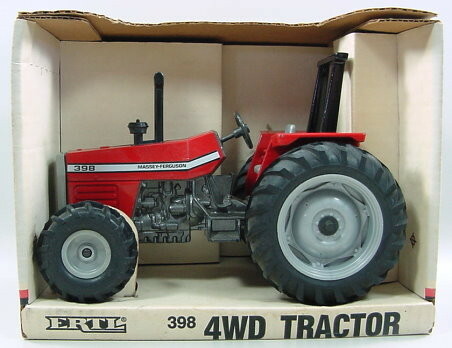 Ertl Stk# 1181 Massey Ferguson 398 4 WD tractor. 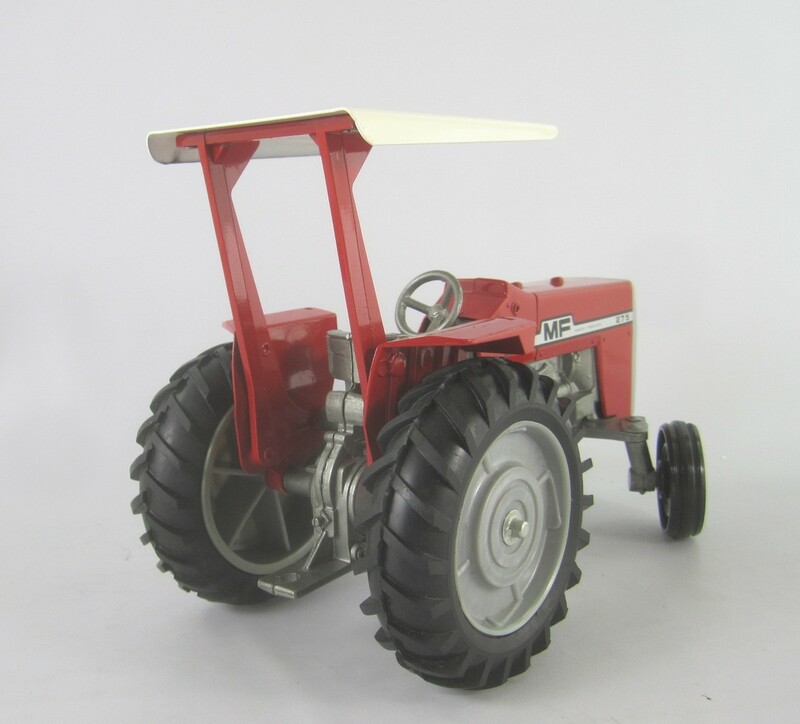 Die-cast metal 9 in long with steerable front wheels and draw hitch. 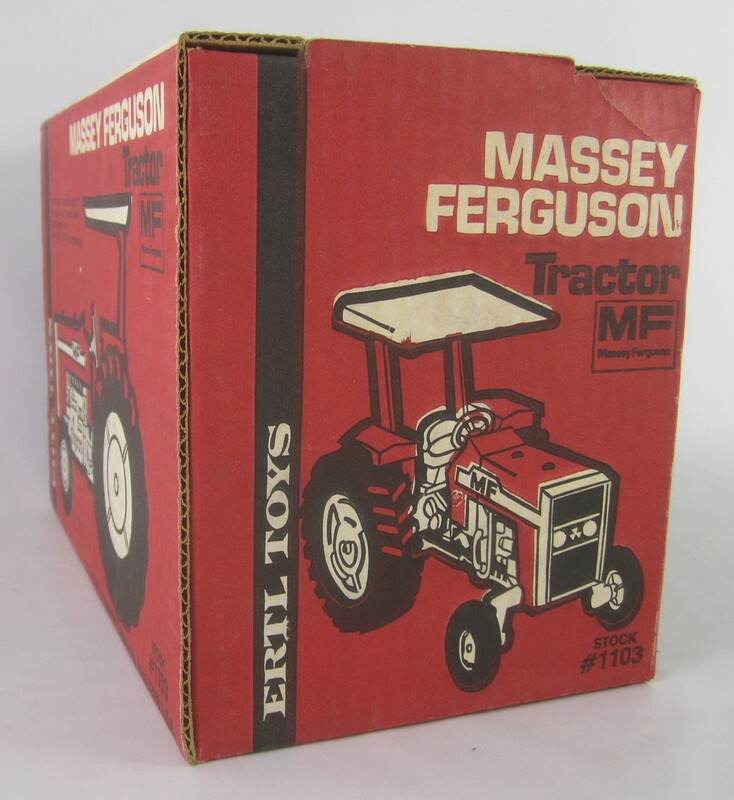 New in Box from 1987. 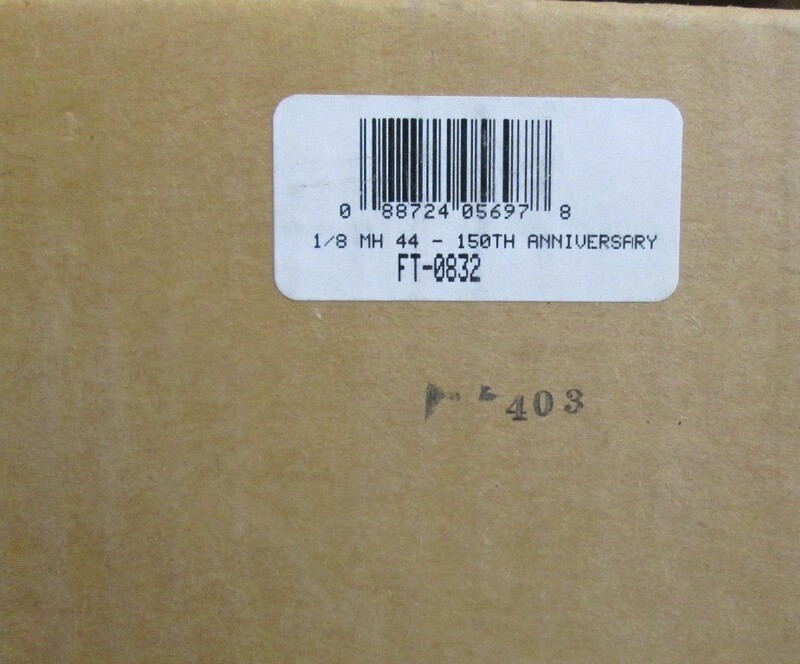 Note: Has original price in ink on top of box. 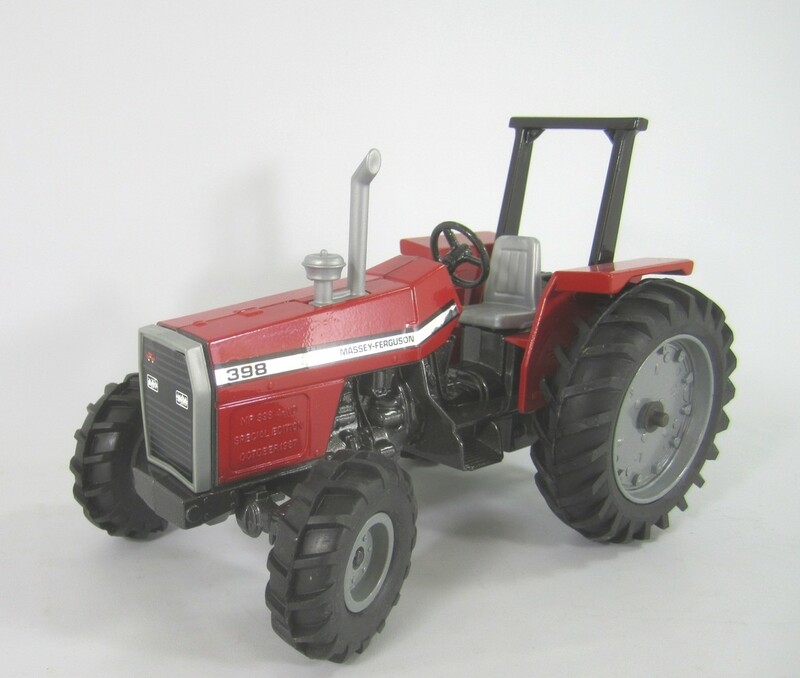 Ertl Stk# 1181TA Massey Ferguson 398 4 WD tractor. 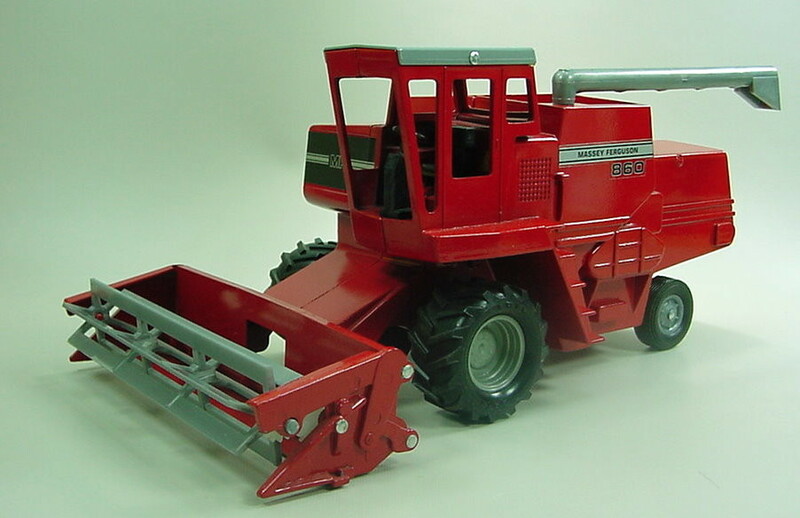 Die-cast metal 9 in long with steerable front wheels and draw hitch. 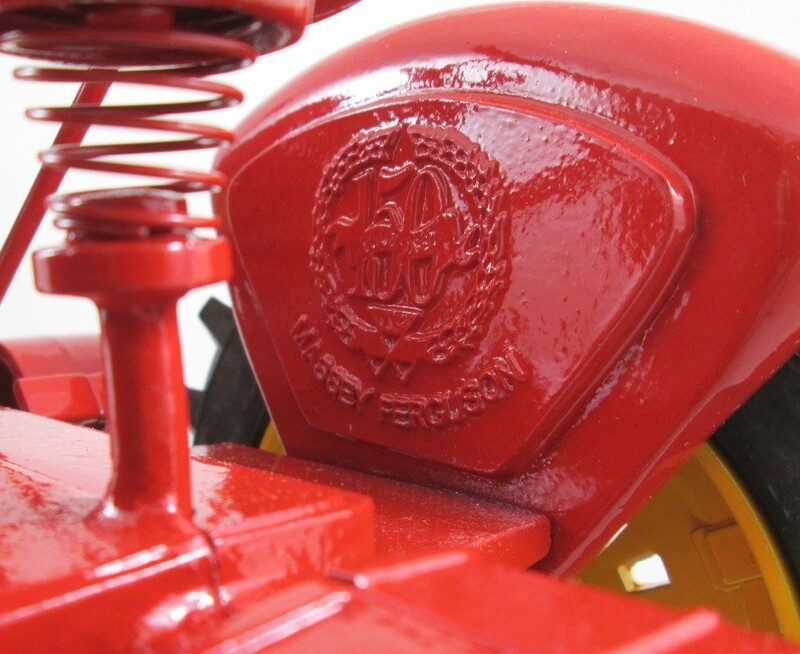 Made in USA. 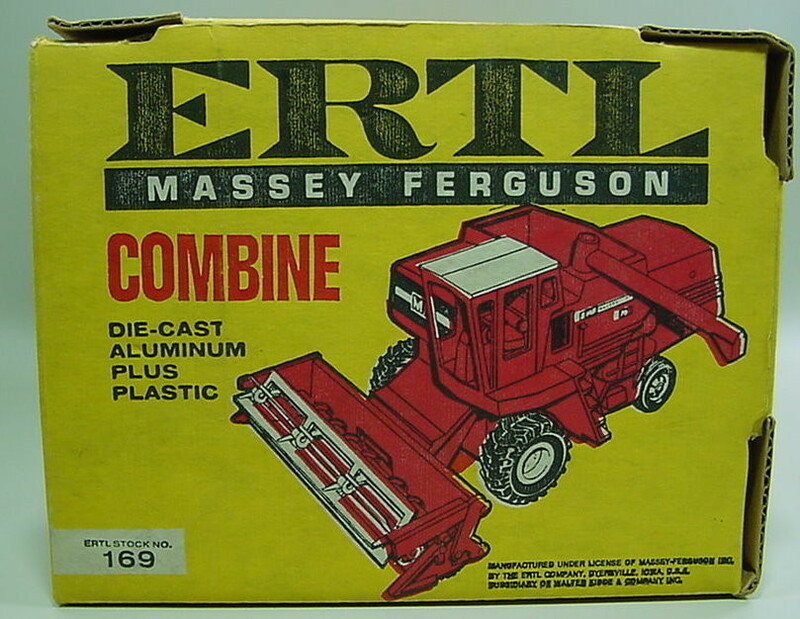 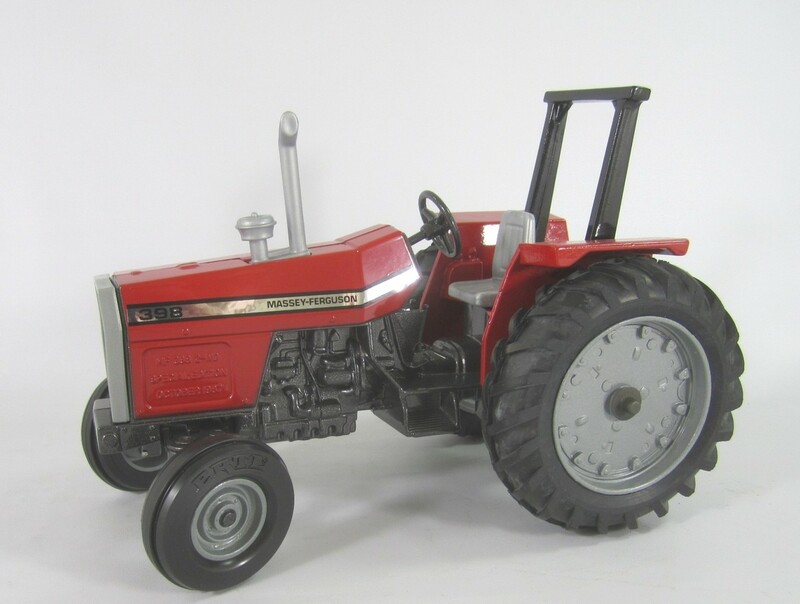 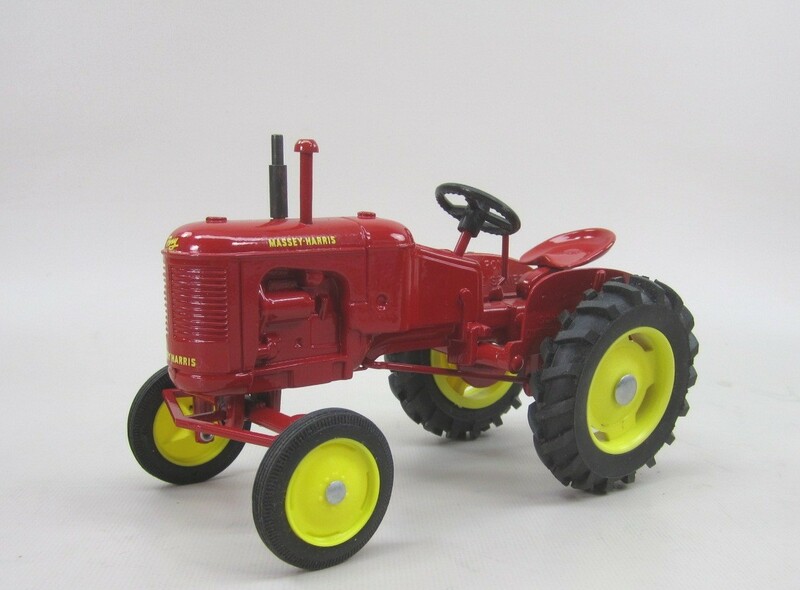 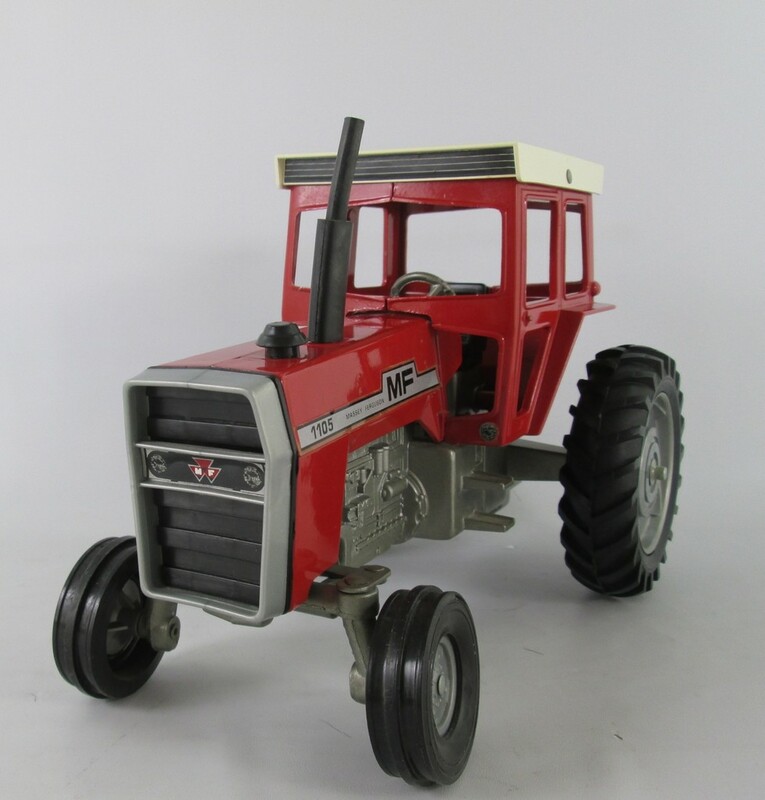 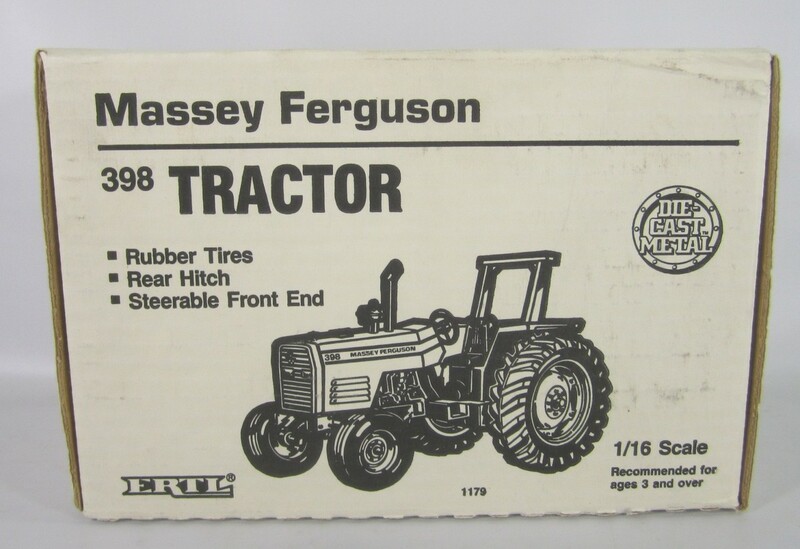 Ertl Stk# 1179TA Massey Ferguson 398 tractor. 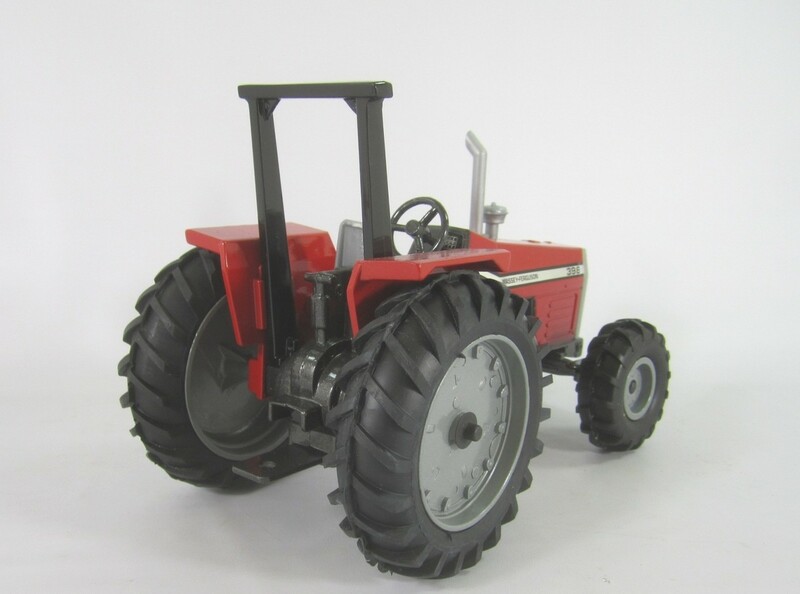 Die-cast metal 9 in long with steerable front wheels and draw hitch. 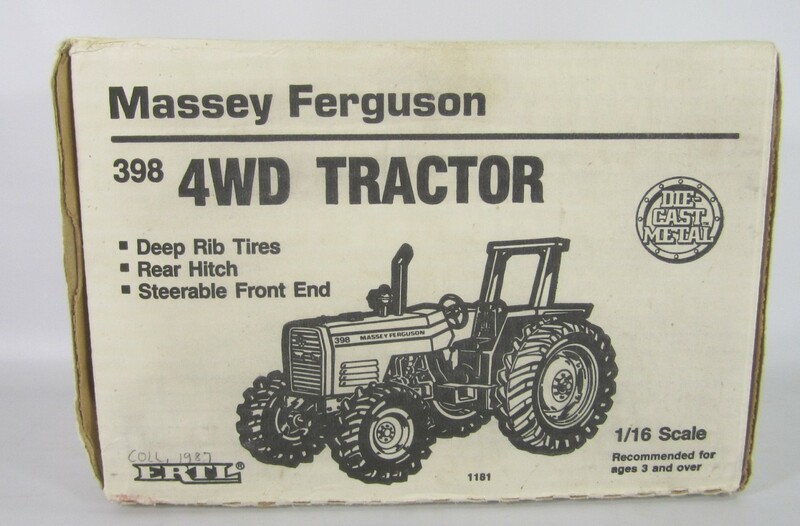 Made in USA. 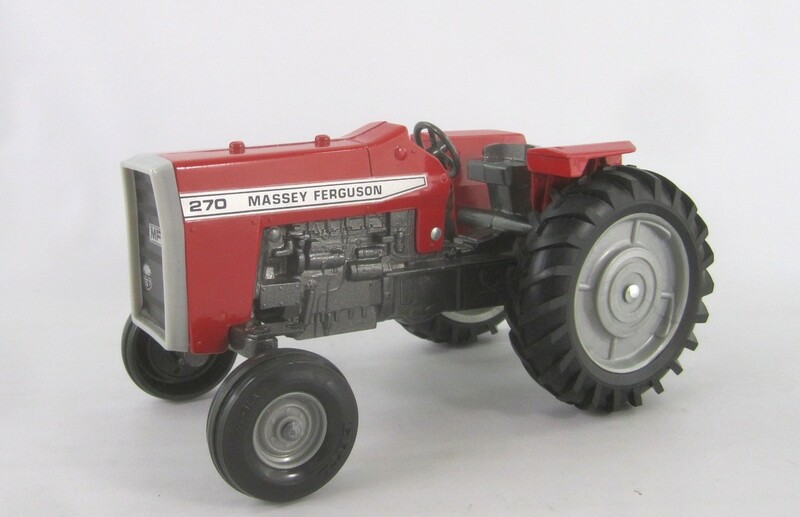 Ertl Massey Ferguson 780 Combine Blueprint Replica to scale (1:20). 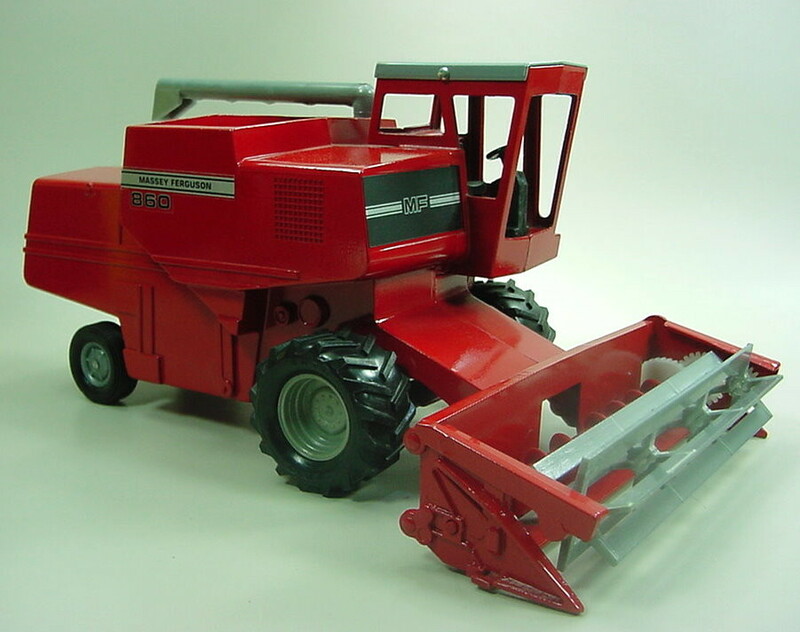 Die-cast metal with movable auger and grain spout. 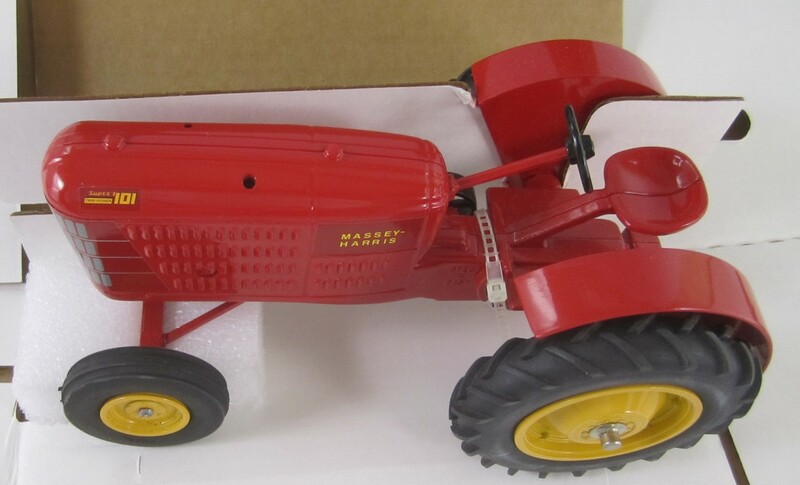 Measures 14+ inches long. 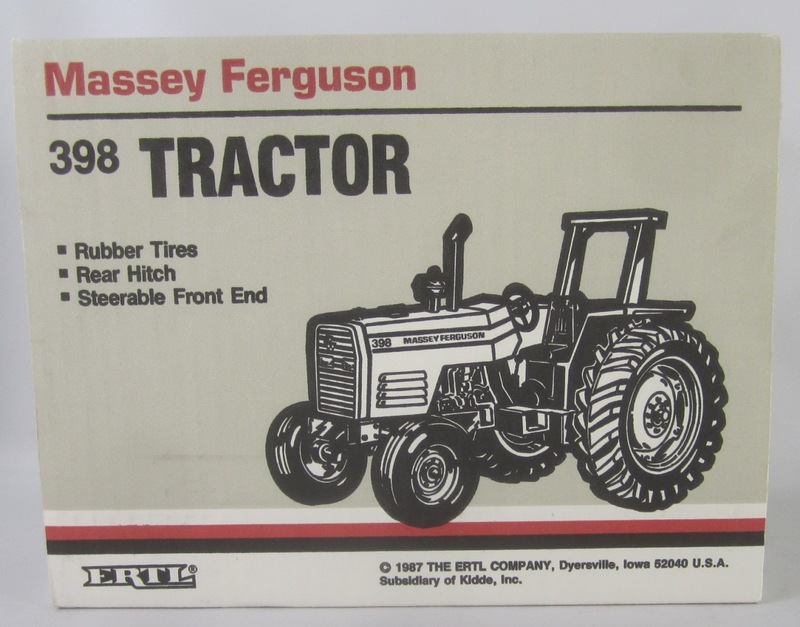 Vintage 1981 Gray Rim and Spout.